I think of November as a month of being thankful, and December as a month of giving. On this weekend in-between, I am doing both. A few years ago, my husband came up with an idea of recognizing someone in his past, who has had an impact upon his life. I adopted the custom - and around this time each year I try to let someone know how much they have impacted me; either with a note, a phone call, or sometimes a gift. Today, I am sending a thank you note with a Starbucks card enclosed in appreciation of a person's kindness, and we are writing a check for a donation, in memory of someone special. I plan to publish lots of posts about giving and gifts in December! I am particularly excited for what I have scheduled for December 15th: a one-day opportunity for bloggers to win a truly helpful prize! Be sure to visit here that day, and enter to win! Even if you are not a blogger, a story will accompany the sweepstake, which I hope you will enjoy. I have only ever been shopping on Black Friday a couple of times. I am content to leave the bargain hunting to others - I just don't have the stamina! I am always thankful for our Amazon Prime membership - it so easy to order on-line, and with free two-day shipping our items are delivered right to our house! The membership fee is a bargain, compared to what we would otherwise spend in shipping fees during the year. If you have someone on your list who is really hard to buy for, an Amazon Prime membership might be the perfect gift for them! Instead of shopping today, I am enjoying time with my family, hopefully working off a little of yesterday's caloric indulgences, and doing a little blogging. I am linking up with the Lifestyle Sistas today; they are hosting a linkup where bloggers can share recipes with five ingredients or less. Conveniently, my daughter often requests one such recipe to be included on our Thanksgiving menu, so it is the one I have decided to share. When you serve this dish - be prepared for questions about how it got its name. It is known that Kraft first sold Pistachio Instant Pudding in the 1970's, and they marketed it with a recipe called “Pineapple Pistachio Delight.” According to a post on Serious Eats, it is thought that it was a Chicago food editor who renamed the recipe Watergate Salad; Kraft eventually adopted the name. Various ideas of why this name was chosen abound: the salad is full of nuts, the ingredients are mixed up into a bit of a mess; there is quite a coverup of the ingredients by the cool whip! My family has renamed it yet again - my daughter just refers to it as “Nixon Salad." Whatever you call it, it is sticky and sweet - and sort of an American tradition. Here is the recipe for it that my grandmother shared with me. 1. Mix pudding powder and crushed pineapple (do not drain) together until well blended. 2. Add marshmallows and (optional) nuts. 4 Chill at least several hours or overnight. Serve with an open mind and full transparency, and be prepared for some political discussion! Whether or not you are celebrating American Thanksgiving today, I hope you have a wonderful day! I am thankful for so many things - including everyone who takes the time to read this blog! There is no better motivator than a healthy dose of competition. Before heading in to work one morning, he asked me to help him find the biggest cardboard box we had. Then, he covered it in scarlet and grey duct tape (OSU team colors) and Ohio State logos and took it in to work. My husband works with a woman who is also from Ohio. She decided she liked his box best. Between them, they completely filled the box with food. I't's hard to say which team garnered the most food - although the Buckeyes were certainly a contender. Who won? Actually, it was the people of Montana who won. It was a win - win: for those who gave, and those who will receive. Have you ever participated in a food drive competition? I attended college in the United States, but my parents lived overseas, - too far for me to go home for any of the shorter breaks during the year. My grandparents, however, lived about three hours away from my campus, so I would catch a ride to their house during Thanksgiving break. It was always fun to spend the weekend with them, and most of my mother's side of the family would gather for the Thanksgiving meal. My sophomore year I decided that I should contribute to the meal. I offered to make the pumpkin pies. My friends questioned my sanity, when they learned I had assumed responsibility for such an important part of the dinner. They asked, "Aren't you worried they won't turn out? People take pumpkin pie seriously on Thanksgiving." Well, I wasn't worried - until they told me I should be. Suddenly, canned pumpkin didn't sound like such a worthy ingredient. I didn't have a car, and I have no memory of how I transported a big pumpkin back to my dorm; but I do remember cutting one up, boiling it, mashing it with a potato masher, and then draining the puree in a colander. It took a long time, and was a lot messier to make in my small dorm kitchen than I had expected! I was so worried that the pie would not be special enough, that I made a lot of changes to the recipe. I still have the cookbook I used, with most of the amounts of the ingredients crossed out and changed. For example, I doubled the recommended amount of all the spices. It is surprising the pie turned out at all! But - it did. My pumpkin pies were a huge hit at Thanksgiving that year. I thought perhaps my relatives were just being kind. However, I have made the very same pumpkin pie recipe many times since, and it has always received rave reviews. Fortunately, somewhere along the way, I discovered that using canned pumpkin does not make a difference in the texture or taste ... which greatly simplifies the preparation. I became very close to my grandparents during those college visits. I have always been thankful for the "home-away-from-home" that they provided for me. Making this pie always brings back those good memories. Do you have a favorite Thanksgiving Pie recipe? When my daughter was in preschool, her teacher arranged a field trip. Like many of the kid's moms, I went along. The weather was mild, and it was a day filled with petting animals, traipsing through the fields, and a wonderful outdoor picnic. The most memorable part of the day was when the farmer came out to have a chat with the kids. We gathered near the turkey pen, and he began to tell them about what it was like to be a farmer. At a certain part of his talk, he suddenly dashed into the pen, and grabbed a big Tom turkey. “How nice,” I thought to myself. “It must be fairly tame and he is going to let the kids interact with it.” WRONG! Mr. Farmer proceeded to lecture our group of little kids, pointing out which body-parts of Tom Turkey corresponded to the kid's favorite cuts of poultry. Wings, thighs, drumsticks ... nothing was a mystery any more! Most of the kids took it in stride - they either weren't listening closely to his words (which were nearly drown-out by the gobble of that Tom), or they had mothers who had already explained the food chain. Not so, for my daughter! She was quite horrified - partially due to the sight of that poor bird hanging upside down in the man's grasp ... but mostly because of what he was saying. Just less than a year earlier, my daughter had learned from another preschool teacher that animals are the source of our meat. I had been present then, as well. "Mommy - really? Meat is from animals?!" (This was said loud and clearly between her sobs.) Her exclamation caused the teacher and other mother in the room to give me glances of sympathy, while they smothered their chuckles. We just had never found the right opportunity to break the news to our small daughter that meat wasn't made in a grocery store! Her kind little heart could barely handle the information the first time she heard it. The farmer's in-depth description, while holding an indignant gobbling bird, was almost more than she could bear. I did serve turkey on Thanksgiving that year - but I don't remember her being very interested in eating it. At least there was no mention of bacon when it was time to pet the pig! At what age do you think kids should be taught about where their food comes from? My Favorite Hat is a Helmet! I like hats - but I look terrible in them. Something about the shape of my head and and my hair just means that they never fit right. I rarely wear a hat. But - - there is one exception. My ski helmet! When I learned to ski as a pre-teen, there was no such thing as a ski helmet. About 15 years ago, you might have spotted a ski helmet worn in a ski resort terrain park; then parents gradually started buying them for their small children. An article published by the International Skiing association, Ski Helmets, How We Got Here, states “from 1995 until 2010, helmet use increased from 5% to 76%. Over that period, the rate of serious head injuries dropped by about 65%.” That's a pretty impressive statistic! Gradually, more and more skiers over the past few decades have begun to realize helmets are a good way to protect their brain power. I was finally one of them. Helmets are available in a wide range of prices. Even the most expensive price tag would seem like pennies, however, compared to a hospital bill ... or a casket. I don't think Giro still makes a helmet identical to the one that I own. I did find a similar one on Amazon.com however. The very first time I wore my ski helmet, I became a convert. Instead of feeling like I looked silly, I felt “cool.” I was now one of the smart people on the slopes - protecting my head! My helmet was light-weight, comfortable all day, and kept me warmer than any other hat I had previously worn. Now I never waste time looking for the right wool hat, while getting ready to ski. I just grab my helmet. Whether you plan to ski, snowboard, or sled, please put on a helmet before you slide down those snowy slopes! It's the smart, comfortable, safe thing to do! So, what's my second-favorite hat? My horseback riding helmet, of course! Do you wear a helmet when you are doing any sports? This post contains affiliate links. The opinions expressed, however, are entirely my own. It's Flu Season. Are You Ready? pain and fever reducing medicines? juice and fluids of choice to drink? Do you have someone lined up to cover your absence at work, for when you or your kids are sick? Do you have a primary care physician, in case you need a prescription for Tamiflu? Have you stocked up on grocery staples and convenience foods, because you won't feel like going to the store or cooking for a while? Do you have extra blankets handy to put on your bed, for when you have the chills? Do you have a second set of sheets available, for when your bed is soaked with fever sweats? IF you do get the flu, your answers to all of the above questions had better be “yes”! Do you practice good hand-washing techniques, all the time? Do you avoid contact with others when you are sick, and do you cover your mouth and nose whenever you cough and sneeze? Do you encourage others to do so as well? HAVE YOU HAD YOUR FLU SHOT?? When my son would get a shot when he was little, I would hold his hand. This year he didn't need me to. Good thing, as I was busy taking this picture for this blog! Cases of flu have already been reported across the United States, and in the town where I live. It takes a few weeks to develop full immunity, so don't wait until all your friends and co-workers are sick! My husband got his flu shot at work early this fall. I was not as proactive about it this year as I should have been. I am embarrassed that it is already nearly the end of November, and I am just now crossing this off my to-do list! I finally got vaccinated a few days ago, and my son received his shot yesterday. I've been sending daily text reminders to my daughter at college - and she has promised she will get hers tomorrow or by Monday at the latest. I will be crossing my fingers until two weeks goes by; about the amount of time it will take for us to develop the full protection of the vaccine. If my kids contract the flu before then, I will feel very guilt for not ensuring that they were vaccinated sooner! Getting the flu, at best, feels awful. At worst, it can be life threatening. It used to be that only certain segments of the population (the very young, the very old, people with certain health conditions, etc.) were recommended to be vaccinated. Supplies of the vaccine are plentiful now though, and it is recommended that most people (with a few health exemptions) receive an annual vaccine. Check with your doctor if you are unsure if you are a good candidate to be immunized. Being needle phobic is no longer an excuse to avoid a flu shot! If you prefer, the vaccine is now administered as a nasal spray. Protect yourself! If you won't do it for yourself, get the vaccine and help prevent spreading the flu to others! Have you gotten a flu vaccine yet this year? If not, why not? Roasted Butternut-Apple Soup. Thanksgiving Worthy! Today I made a very rich and delicious soup. A small bowl of it would be perfect as a starter for a Thanksgiving meal, or for a Black Friday lunch with bread and a salad. This soup is such a pretty color, it would also be a lovely addition to an autumn buffet meal; it would be fun to set out in petite clear “shot” glasses, with little spoons provided for each. There is a story as to how this soup came to be . . .
A Huge Timesaver: Ask a Question! Today I'm sharing information about a new addition to this blog, a little insight that I have learned about the blogging process, and an observation about a tool that can save everyone tons of time in many situations in life! The frequent visitors to this blog may have noticed a cute little ladybug banner has been added to the homepage. Today I am going to explain why it is there - and the important life skill I was reminded of in the process of placing it there. Blogging can be just a hobby, or a source of income, but either way it involves quite a bit of work, and there are some costs associated with owning a blog. While I never want the main focus of this blog to be advertising, I have decided it is time for this blog to participate in a few programs to earn its keep! I love to share products I enjoy with my readers, and I frequently write about them without any sort of compensation. Yesterday's post is a perfect example. However, if a company wants to pay me to write about, review, or advertise a product I already love; I have decided I will sometimes do so. I would probably tell you about it anyway! I will NEVER promote anything, though, unless I can honestly tell you I like it. I will never sacrifice quality of content for a monetary opportunity. I promise you that! Back to the Ladybug banner. I was recently contacted by a manager of the Affiliate Program of PartyPail, an online party supply retailer. She asked if I would be interested in supplying information about their products to my readers, with the possibility of earning a small commission from any sales my promotions generate. PartyPail has a wide variety of party items, and as I write quite a bit about entertaining, informing my readers about these products seems like it could be helpful. I'm sort of partial to ladybugs, as my daughter absolutely loved them when she was small, so I chose that theme of banner to display. They have some really fun ladybug party supplies! A photo of our little ladybug girl! PartyPail uses ShareaSale as a third party affiliate to manage this program. In order to set up an account with them and verify my blog, the instructions explained that I would need to alter the html code of my blog template. GULP! I was really nervous about doing this, and had a bunch of questions as to how to do it. After hours of reading tutorials and trying to figure it out on my own, I finally decided to call the company and ask for help. When I did, I learned two things. I had been busy all day, so I had not given much thought to supper. Fortunately, my son had other plans and neither my husband nor I were very hungry. I poured a glass of red wine, and we talked about our day as I perused the pantry and fridge for ideas. I settled on a homemade flatbread pizza. Well, not completely homemade ... I took a short cut and used a store-bought crust. The Italian Artisan Pizza Crust made by Stonefire is as good as any crust that I can make - and I had one in my pantry. Less than half an hour later, we were eating a flatbread pizza that my husband and I both thought was delicious. Quick. Easy. Yummy. Satisfying. A perfect Meatless Monday or any weeknight (or weekend) meal! Of course, I had to name the recipe after my blog. Toward the beginning of October, I wrote two posts in which I asked my readers for their help. Many of you replied with helpful information. Here is the followup. On October 7th, I wrote a post called Please Help Me Pick Out My Birthday Present! I was really stuck trying to decide which computer would be best for me, and my readers supplied a lot of good advice.Taking it all under consideration, I made one more trip to Best Buy. One of their tech guys was really helpful, and he made a point that tipped the scales. He suggested that anyone spending a lot of time looking at a computer screen will develop much less eye strain using the Retina Display model of the MacBook Pro Retina. That made a lot of sense to me. I am now the proud owner of a MacBook Pro Retina, 13 inch computer. Many thanks to everyone who gave input to this decision. So far, I really like it!! On October 8th I wrote The Purple Toy, a post about needing to replace my dog's favorite toy. We were unable to find one anywhere, and I wondered if a reader might recognize the brand. A number of people thought it was a Kong toy, but while it is similar to a Kong, it is not identical. The American Thanksgiving holiday is just less than two weeks away. In addition to being a time of family gatherings and big feasts, many of us think conscious thoughts of gratitude. My laundry room always served as an art gallery for the masterpieces my children brought home from school. I cannot bring myself to take them down - I get too much pleasure from looking at them even now. Some of this artwork has an extra-special significance to me at this time of the year. On one wall hangs two of my prized possessions - one made by my daughter and the other by my son, when they were both in preschool. My daughter’s was a Thanksgiving craft. Using her newly acquired skill of cutting with scissors, she cut, pasted, and drew a turkey. The teacher asked her what she was most thankful for, and then wrote her comment on her turkey: “I'm thankful for my mommy.” (Before you get the impression that I am the favored parent - her daddy got lots of affirming artwork too!) Each time I've looked at this simple little sentence, it has never failed to warm my heart! For my son’s craft, someone traced his tiny preschool hands. He cut out their shapes and glued a heart between them, as though the hands are holding it. It was not a Thanksgiving craft - but it makes me feel thankful whenever I look at it. His hands are now bigger than mine, but I am so lucky to have held his, as he was growing up. He will always have my heart! The paper of both of these crafts is old and faded. The writing on the turkey is a little smeared. But when I look at them, I am transported back to a time when my children were small, and I was the very center of their universe. I hope they both know how very thankful I was/ am/ and always will be, that I have had the privilege to be their mom. Why wait for Thanksgiving? The true value of the holiday, I think, is how it reminds us to take a minute, and tell others how much they mean to us. To reflect upon the good things in our lives. To relive a memory or make a memory. To do something to make someone else thankful for us. It sounds like a good way to make this weekend wonderful. Happy weekend! Is there artwork that makes you feel special or reminds you of the past? I repurposed a Halloween pumpkin for Thanksgiving! 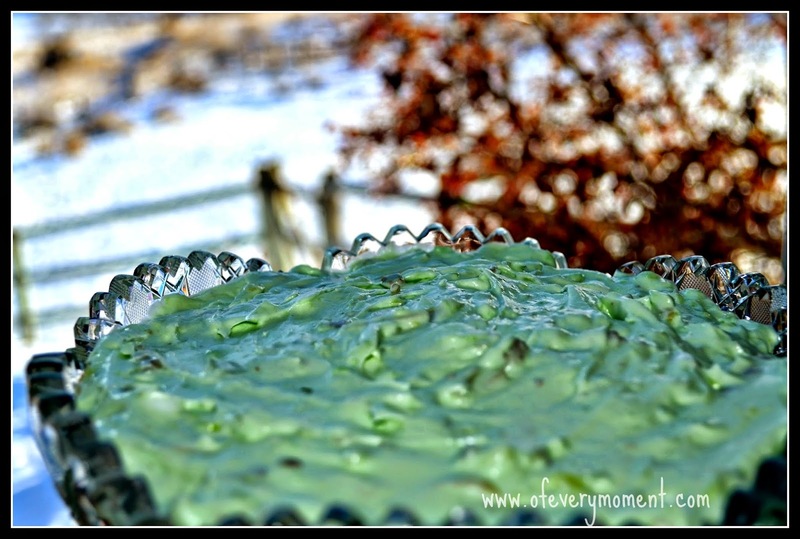 I completed this craft and tutorial - then realized I had made some pretty funny errors! See if you can spot them, before I tell you what they are. Do you remember the pumpkin I decorated by hot-gluing swirly designs of black chenille stems? When Halloween was over, the chenille stems easily peeled off - leaving me with a perfectly good pumpkin. I debated about using it to do some baking ... but its shape and stem gave me another idea. This would be a fun craft to do with or for young kids. Writing this post is my attempt at an attitude adjustment. I almost always absolutely love living in Montana. However, there are times, such as today, when I have questioned exactly WHY it is we live here? In fact, I think I was chanting the question aloud today as I was driving home in my ice-cold car. Ten Nine Things I actually love about winter. 1. Sunshine glittering beautifully on snowy hills and mountains. 2. The kitchen isn't too hot for baking, and it is the season for soups and stews. 3. My pets don't shed as much as they do other times of the year. 9. Winter has lots of warmer days; it doesn't last forever; and it is followed by Spring! I only came up with nine reasons (not ten)! If I think about this longer, however, I am sure that other good things about winter will come to mind. Reminding myself of this list, along with all that I “sort of like but don’t actually love” about these cold weather months, will make the less desirable parts of winter more bearable. Maybe I still love living in Montana, after all! What is winter like where you live - and what do you like about it? It is my pleasure to report that Jack Pumpkin has died. I have never known a death that I have mourned less. An altercation with this villainous pumpkin cost my son a trip to the Emergency room, from which he emerged with four stitches. Jack Pumpkin was banished to an out-of-the-way spot outside, and forgotten about until today. My son's stitches have been removed, and his thumb has healed ... and the guilty pumpkin has met its demise. Usually I am a little sad when the lifespan of a Jack-'O-Lantern comes to an end. How soon after Halloween do you discard or put your decorations away? November - a month for memories. The poppy is a popular emblem worn on November 11th. November 11th is a day of remembrance in many countries. For me, the whole month of November is one of both historical significance and personal remembering. World War I ended on November 11th, 1918. On the 11th hour of the 11th day of the 11th month of 1918, an armistice was signed. This day was originally referred to by the USA, Canada and Great Britain as Armistice Day. When I was growing up in Canada, November 11th was always more commonly referred to as Remembrance Day. Felt or plastic poppies were handed out, and on November 11th we all wore them pinned to our clothing. I remember school assemblies and moments of silence. We worked on our penmanship by writing out the words to the poem "In Flanders Fields," written by John McCrae in 1915. The year that my family moved to Europe, I was in London, England on November 11th. It was the same week that Princess Anne was getting married, so my memories of public wedding festivities and Remembrance Day ceremonies are a little muddled. Armistice Day is also known as Remembrance Day or Poppy Day in Great Britain. Many citizens wear poppies, and hold a moment or two of silence at 11 am. The main ceremony of remembrance though, occurs on the Sunday closest to November 11th, known as Remembrance Sunday. Generalissimo Francisco Franco, a Spanish Dictator for nearly 40 years, died on November 20th,1975 in Madrid. It was a pivotal time for Spain, and an interesting but somewhat frightening time to be living there. This is a photo of the newspaper I saved from the week Francisco Franco died. In the United States, the official name of Armistice Day was changed in 1954 to Veterans Day, and it became a day to honor all military personnel who have served our country. To me, this is tragic. Of course I fully support remembering and honoring all of our veterans and everyone who has served our country. What bothers me is that there have been more wars after the “War to End All Wars.” The name of Armistice Day was changed because of the lack of peace our world has suffered since 1918. If only that war really had ended all wars. November is a month of birthdays for my family. Time to reflect on many memories and celebrate the future. Happy Birthday to our family members and all those born in November! November is the month when I became a writer... it is a milestone I like to celebrate! November 11 - and we have snow on the ground. Yesterday afternoon it was 45 degrees F. (7.2 Celsius) here; 24 hours later it was 10 degrees F. (-12 Celsius) and snowy. Remembering that winter has come much earlier most other years has helped to make today's weather a little more bearable! Speaking of temperatures changing quickly, the tragic Midwestern US Armistice Day Blizzard of 1940 showed just how sudden and severe a storm can be. The view out my front window today. Perhaps the month of November should really be called Novembrance. What is your earliest November memory? I set the defrost on the highest setting, scraped the windows, and eased onto the stiff, frigid leather of the driver's seat. Fortunately, the car is a hybrid. Even with its economic use of fuel, there was barely enough money in my checkbook to cover the gas for this trip. At least I wouldn't be spending as much at the grocery store this month, thanks to the generous food donations in the trunk. It seemed feasible that my finances would at least break even. There were Thanksgiving leftovers for at least two meals. The gelatinous casserole which Mary (my stepmother) had bestowed upon me should feed me for at least three days. She always tried to win me over with food - but like her personality, her cooking just always fell a little short of the mark. Beggars can't be choosers though - and at least I would have food to eat when the bank account was drained. I had chosen to compete in this meet because it was only fifteen minutes from my Dad and Mary's house. Kill two birds with one stone, as they say. A perfect opportunity to have Thanksgiving turkey with my dad (fortunately he always insisted on cooking the holiday meal); and a chance to prove that I am still the competitor I used to be. I hadn't planned on the Arctic front that had moved in suddenly. It was so cold it made me squirm in my seat; waiting for the seat warmers to do their job and the heater to begin to blast warm air. Good think I had been keeping up with the car maintenance - not a good day to break down in the middle of North Dakota! Hopefully too cold to snow, but I regretted not getting my snow tires put on last week. The meet had gone well. Dad and Mary had been there, spectating. Somehow though, happiness was elusive. Hanging from the rear view mirror now were shiny medals, cold comfort for the feelings of inadequacy I had been experiencing over the past year. Becoming a champion again helped me believe in myself. It lacked the thrill it used to have, however, when Mom was there clapping and cheering as I received my awards. 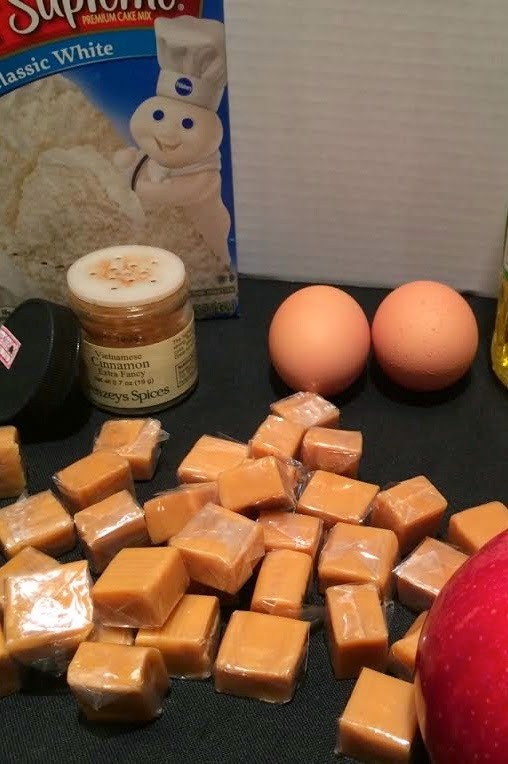 Yesterday, I shared some apple recipes and showed you a photo of some ingredients. I mysteriously told you that I had invented a recipe using them, but it would not be posted until today. Some of this baking was to used as a gift, and I wanted to deliver it before I published the photos! Whether you are back from curiosity, as a loyal reader, or just visiting this blog for the first time, I hope you enjoy this recipe. The ingredients of my mystery recipe: a white cake mix; two eggs, cinnamon, oil, apples and caramels. about 12 soft caramels, cut in half. Preheat oven to 350 degrees; line a cookie sheet with parchment paper. Add eggs and oil. Beat well until incorporated. Drop cookie dough by generous tablespoons (I used my large cookie scoop) onto prepared cookie sheet, about 2 inches apart. Gently press a half caramel into the center of each cookie. Bake about 12 minutes, until very lightly browned and caramel has melted. They will still appear a little under-done, but will firm up as they cool. Cool 5 minutes on pan, then place on wire rack to cool completely. Making cookies from a cake mix is a quick and easy way to bake up a batch. The first time I ever did so, I followed a recipe my (then) 12-year old niece had written down for me. The variations are endless. A little imagination is all that is needed to alter the basic recipe to whatever flavors you desire. Here's another variation you might like to try. These cookies turned out very soft with a chewy caramel center. The flavors of a caramel apple in a cookie. I'm so happy with them, that I might just decide to name them after my blog! Making quick and scrumptious cookies certainly seems like a good way to make use of a few moments. The cookies are quickly disappearing, but I put some aside for the gift I mentioned. Curious as to who the recipient might be? My neighbors who provided the apples from their tree, of course! 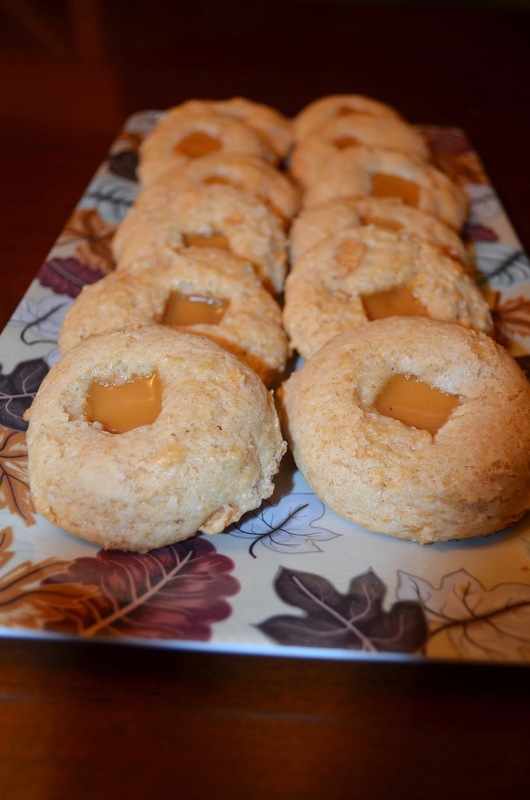 "The most - - of Every Moment Caramel Apple Cookies"
As pretty as they are tasty! Today is November 4th - Such a Special Day! Sometimes, Good Things in Life ARE Free! Left-over Candy, A New Month, and Move the Clock!